Aww cute 🙂 I have a lady in my study due on Valentines’ too! Guess what their little girl is going to get? This hat is adorable! Thank you so much for sharing the pattern! Beautiful hat! What adjustments would I make to make this hat larger? Like for a toddler and an adult? Thanks! Hi Kendra, if you’d like to make a larger hat for an adult, check out the Jenny Lee Hat Pattern here. Que lindo este gorro, adorei. Obrigada por partilhar. When the pattern says to “do 2 dc in the same stitch” at the beginning of the round, the stitch it’s referencing is the beginning ch-2 from the previous round. Essentially, you work your first puff stitch right where the round starts naturally. Hope that helps! I can’t seem to understand how to start rnd 3. I know aimee asked a similar question, but I dobt undestand where the ch. 2 is suppose to go. Please, help me, jayna! Round 3 says to: Ch 2, DC in same stitch (counts as first dc2tog cluster). Work dc2tog cluster across next 3 stitches. Let’s back up a second and focus on the last part of Round 2. When you get to the end of Round 2, you join the round by working a slip stitch into the top of the first ch 2 of the round. Working that sl st will finish the round (by closing the “gap”) and set you up nicely for working Round 3. In Round 3, you start by working a ch 2. This will give you the height of a dc stitch and is a very commons way to start a crochet round. Then, you continue working the dc2tog clusters around. If you think about it, the ch 2 that begins Round 3 isn’t really worked “anywhere” – its purpose is to make a stitch that’s as tall as a dc stitch so you’re ready to start working your dc2tog clusters. The ch 2 gives you some height and allows you to start Round 3.
lol thanks, i kinda figured but wasn’t sure because it wasn’t mentioned, but i understand it now. thank you so much for clarifying, and for this beautiful pattern also. Hi JJ, lovely pattern but working through round 3 I seem to come unstuck! Hi, Jayna. Such a cute hat. I have the same question as Fee, above. I am left with one remaining stitch in row 3. If I put another dc2tog cluster in that stitch that would give me 24 total clusters, not 22. Please help! Love this! After 2 tries I finally got it right. But…I don’t understand the heart instructions. Love the hat thought! Thank you! 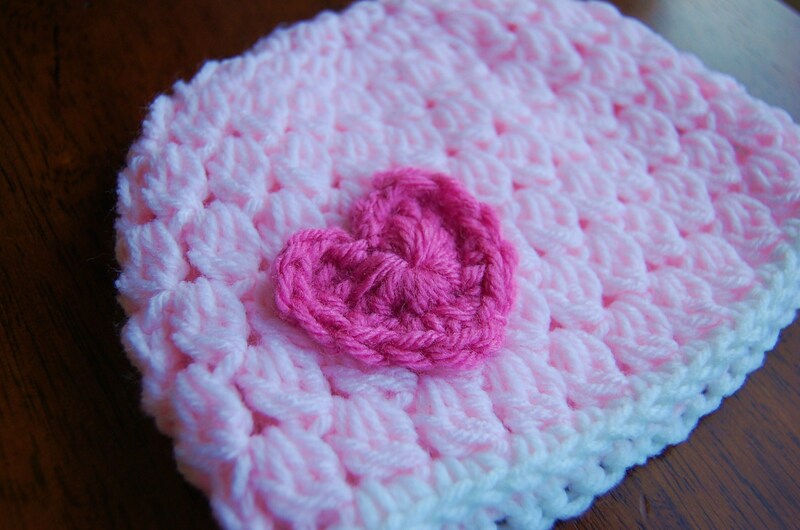 I will find a heart somewhere else maybe, want this for my new grandbaby girls first Valentines day! I love this pattern and made it for my second daughter who is due any day now. I would like to make one to match for her big sister who is 4. Do you have any recommendations on how to make a larger version of this? I would really appreciate it! I am also stuck on round 3 am also come up with 24 clusters instead of 22. Any help would be appreciated. Thank you! Love this hat! I made it in record time. Thanks for posting it. I also have a question about the heart, what is tr? Aww this is cute, I love the heart motif. Hello, I’m loving this hat pattern and I’ve actually already attempted to begin it. However, I’m already in round 4 and can’t seem to understand what you mean by working in between each cluster from the previous round. Do you mean that I should skin a stitch every time I’m going to work a new dc3tog? That’s what I did for round 4. 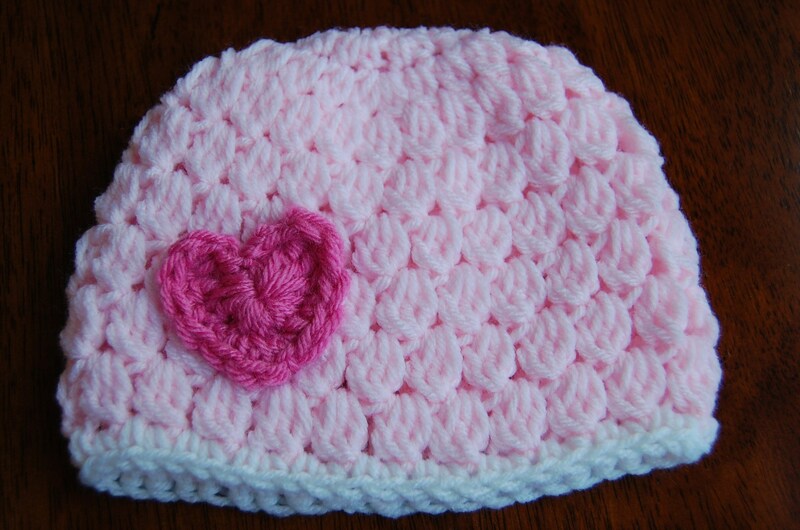 I really want this hat to come out good since I would like to give it away to a newborn baby girl too. Also, I don’t know if it’s because it’s way too early in the process, since I’m only at round 4, but my hat doesn’t seem to get bigger in width. It’s still quite small and despite the fact that its a newborn hat, I’m sure it won’t fit the baby’s head. I’m hoping its because I’m still not far along enough. Thank you in advance. 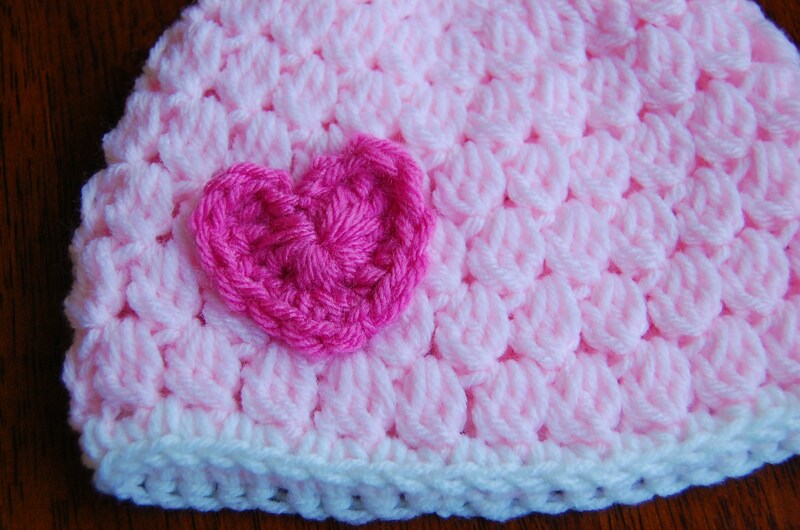 This pattern is perfect for a Christmas hat for my grand-daughter. She is 1 year. I would like to increase the size to fit her. I am continuing the hdc round one more time…do you think that will do it? Thanks for the comments. I’ve adjusted the stitch count in Round 3 to be 25 clusters instead of 22 based on how the pattern is written. Appreciate the help! Oh, also the hat seemed to have a bit of a wave to it, top to bottom in 3-4 places. Unsure what I did wrong. Cluster count was correct, put one cs in between. It started early in the pattern, thought it might work itself out. Otherwise, beautiful hat that I will probably donate to charity. I love this hat and my newborn is wearing it right now? How would I resize this to fit a 3-6 month size? Thank you! The hat in the picture is adorable. By the time I got to round 4, when I folded the hat flat it was a half circle rather than tapering down like a hat should. I have 25 clusters but as comment above says its wavy and too full. I thought of going to G size hook when I start cluster rows. I’m using simply soft yarn. Love the hat. I’m going to try again. I have frogged it out so many times, the yarn is going to be wore out before I can get it done. I have been crocheting all my life and have made many things but this is ridiculous. I have to agree with Martha Shears….i’ve been crocheting pretty much my whole life…i can’t for the life of me figure this one out.. way too many cluster stitches…way too full..doesn’t even look like a hat..i give up…and you’re right Martha..its pretty ridiculous…. Fantastic hat! I am a pretty novice crocheter, but was able to follow the pattern exactly and the hat looks amazing!! Can’t quite get the heart right though, will need to keep trying! Oh my, what a sweet hat! 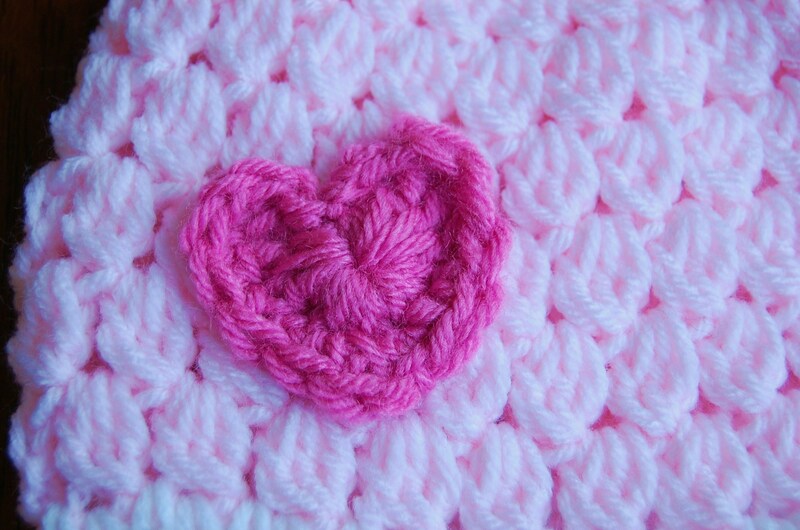 I’d like to include a link to your website and one photo in a Valentines Day crochet pattern roundup if that’s alright with you. It will be posted later this week on candleinthenight.com. Thanks so much!